Española was founded in the 1880's as a stop on the Denver and Rio Grande Railroad. The railroad has disappeared, but the city has grown and prospered as the commercial center for the Valley's smaller villages. A community rich in tradition and values, the cultural quilt of Española encompasses many centuries old history. From the moment Don Juan de Oñate established the first new-world capital here some 400 years ago, Española has been defined by diversity and cultural mobility...everything from extraordinary low-rider automobiles to world-class dining and sightseeing. Deep Hispanic family roots coexist easily with contemporary values and practices, giving Española its own unique personality. In July, the city commemorates the Valley's founding in 1598 with the Fiesta del Valle de Española. The farolitos and luminarias lining the streets give Christmas Eve a special New Mexican flavor. Near the junction of the Rio Grande and the Chama river, across the bridge from San Juan Indian Pueblo, the ruins of San Gabriel de Españoles overlook a broad valley. Captain Juan de Oñate settled his colony here on July 11, 1598. Oñate laid out the first "acequia" or irrigation system. Tradition gives the present San Juan acequia as the first one established by the colony and therefore, the oldest irrigation canal in the United States. He brought from Mexico about three-thousand head for breeding and a thousand head for mutton. His livestock included 1,000 goats, 300 black cattle, and 150 mares and colts. The San Juan Indians had welcomed the Spanish in 1598. In 1680 they took the lead in expelling the colonists. The Indians had been under Spanish rule for three or four generations. Finally a San Juan Indian with great administrative ability, succeeded in organizing many of the natives and planning an uprising. Tradition gives as the immediate cause of hostilities, the caving in of a silver mine with great loss of life by the enslaved Indians. Because mining had been carried on by the Colonists, the Natives destroyed all traces of the mines. In April of 1695, Don Diego de Vargas personally led the settlers from Santa Fe to Santa Cruz. The resettlement of the valley by de Vargas was named La Villa Nueva de Santa Cruz de los Españoles Mexicanos del rey nuestro Don Carlos Segundo. It was called Villa Nuevo because the original villa built by Oñate colonists had been largely destroyed by the Indians who raided it in 1669. It was usually referred to as Villa Nueva or La Cañada. 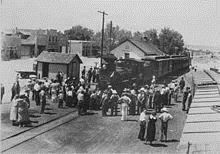 Española became a city in 1880 when the Denver and Rio Grande Western Rail Road, the famous "Chile Line" arrived.